Shayon Harrison’s dynamite dribbling has helped Melbourne City end their A-League season on a high, with a 5-0 win over Central Coast. But paradoxically, the belting could cost City as they aim to reach a first grand final in the club’s history. Warren Joyce’s side ended their Mariners hoodoo at AAMI Park, overcoming the wooden spooners for the first time this season in emphatic fashion. Harrison scored a classy brace to bookend Riley McGree’s volley and Dario Vidosic’s tap-in on Friday night. Ramy Najjarine then netted a rocket for his first A-League goal, putting Alen Stajcic’s sorry outfit to bed. The win takes City equal on points with fifth-placed Wellington, who travels to play premiers Perth on Sunday. That result at HBF Park will now determine the final make-up of the finals. Should Glory beat the Phoenix, expected to be under-strength, by two goals, City will head to Adelaide for their elimination final instead of staying home for a derby with rivals Melbourne Victory. 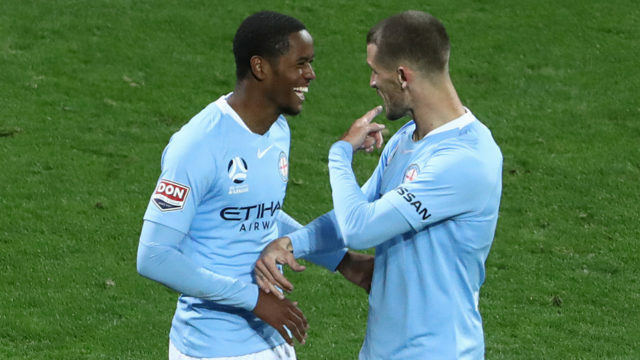 Given City are on a 12-game unbeaten streak at AAMI Park, haven’t lost to Victory this season, and captain Scott Jamieson has labelled Victory as their preferred finals opponents, their 4-0 win could well be bittersweet. At least City will enter the finals with a head of steam courtesy of their big win. Joyce rested a string of key players – including marquees Jamie Maclaren, Ritchie de Laet and Eugene Galekovic – keeping the finals in mind. Harrison transformed a staid affair on 34 minutes with his fancy footwork. The Tottenham Hostspur loanee jinked past Matt Millar, Jacob Melling and Jem Karacan before toe-poking past Jack Clisby. That delightful effort laid a base for City to go on a spree. McGree leathered a close-range volley from Jamieson’s curling cross before the break. After it, Luke Brattan won possession and set up Lachie Wales, who slid a low cross for Vidosic to get in on the act. Then Harrison reappeared to score a second, latching onto Wales’ through ball, completing a 20-minute four-goal rout. They weren’t finished, with Najjarine netting a breakaway effort in injury-time to equal City’s biggest all-time win. Joyce also threw on Idrus Abdulahi late in the match, making the 16-year-old the youngest man to represent the club. The post Unexpected downside after Melbourne City’s goal blitz appeared first on The New Daily. Photo - A night to forget in Melbourne. A night to forget in Melbourne. Photo - City hold a half time lead. City hold a half time lead. Our final team sheet of the Hyundai A-League 2018/19 season is locked in. C’mon you Mariners! Photo - It’s our final GAME DAY of the season. We take on Melbourne City FC in Melbourne! It’s our final GAME DAY of the season. We take on Melbourne City FC in Melbourne! Two #CCMFC Academy young guns are set for the Friday night lights of AAMI Park! Everyone at #CCMFC would like to congratulate Corey Gameiro & Lucy Zelic on the arrival of beautiful baby Mila! Photo - Back at it. A huge thanks to all of the girls who attended our Mighty Mariners School Holiday Clinics. Photo - Miss the action on Friday night? Silly old you! See City v Central Coast highlights ? Miss the action on Friday night? Silly old you! Warren Joyce handed Melbourne City FC's youth brigade an opportunity ahead of the Hyundai A-League 2019 Finals Series, and they did not disappoint. Shayon Harrison, Riley McGree and Ramy Najjarine all found the net in style. Ramy Najjarine with the goal of the night for Melbourne City FC. We've capped off the season in style! Now we await our opponent for the first week of the Finals! Photo - A five ⭐ performance from Melbourne City FC. A five ⭐ performance from Melbourne City FC. Video - Riley McGree volleyed home after Scott Jamieson's centimetre perfect cross. Riley McGree volleyed home after Scott Jamieson's centimetre perfect cross. Video - Riley McGree goes BANG! Video - A bit of razzle dazzle from Shay Harrison! A bit of razzle dazzle from Shay Harrison! Photo - Melbourne City FC are in control at the break thanks to goals from Harrison and McGree. Melbourne City FC are in control at the break thanks to goals from Harrison and McGree. Shayon Harrison with a superb solo effort for Melbourne City FC. Craig Goodwin takes out the member vote for our final Stillwell Hyundai Player of the Match for 2018/19! Video - Kosta's strike for the third goal! Kosta's strike for the third goal! Tony Popovic shares further thoughts on Sunday's showdown with Wellington Phoenix FC. Photo - Our team is in for tonight's clash against Central Coast! Our team is in for tonight's clash against Central Coast! Come for the NPL, stay for the A-League squad signing session! Discounted merchandise available too so gear up for Finals and get the boys to sign it! Photo - Yesterday, we said farewell to two Club legends! Thanks for everything Matty & Riki ? Yesterday, we said farewell to two Club legends! Photo - The club's night of nights is almost here! The club's night of nights is almost here! After such a memorable and record-breaking season, the 2019 MGP Awards are not to be missed. "Everything I did the boys were like it's the last time you're gonna touch this or that so it felt like I was dying"
Bridgey opens up on his very last training session with the Red & Black. James Troisi is racing the clock to be ready for Melbourne Victory Elimination Final. James Troisi is racing the clock to be ready for Melbourne Victory's Elimination Final. THAT penalty from Eric Bautheac, Goodwin's sublime finish and so much more. Relive all the highlights as Adelaide United edged Brisbane Roar in an eight-goal thriller. Tune in to SKY Sport NZ 3 on Sunday 28 April from 9 pm to catch your Nix end the regular season before the Hyundai A-League Finals Series 2019 begin. Sydney FC, Sydney United 58 FC and Football NSW have agreed that all NPL New South Wales fixtures at Lambert Park tomorrow will be played behind closed doors. Relive all the highlights as Adelaide United edged Brisbane Roar FC in an eight-goal thriller. Photo - We're having a HUGE sale at tomorrow night's game! We're having a HUGE sale at tomorrow night's game! Wanderers Shop merchandise outlets inside ANZ Stadium are located at Aisles 110 and 127. Plus a trailer will also be outside at light tower 4! Tony Popovic discusses Sunday's clash with Wellington Phoenix FC at HBF Park. Photo - Adelaide United Fan Day TOMORROW! Adelaide United Fan Day TOMORROW! Gear up for Finals with discounted merch! Sky Blue star Anthony Caceres is primed for a huge title push as we get set to round out the regular season tomorrow against the Jets! Photo - Welcome to Suncorp Stadium Robbie Fowler! Welcome to Suncorp Stadium Robbie Fowler! King Bridge will never be remembered for a single contribution to Wanderers history but for many moments that have defined the path the Wanderers have taken over the last seven seasons. Saturday night will mark the end of an era for the Red & Black. Is your team limping or flying into the 2019 Finals Series? The Hyundai A-League Finals Series schedule has been confirmed! It all begins next Friday night in Melbourne. Photo - How good is this! Melbourne City FC is undefeated in their last 11 matches at AAMI Park. Will Warren Joyce's side extend that streak against the Central Coast Mariners? Photo - The date, venue and time for our Hyundai A-League Semi-Final have been confirmed! The date, venue and time for our Hyundai A-League Semi-Final have been confirmed! Ticket details TBC, who do you want to see your Sky Blues face? Our focus is solely on tomorrow's match. Some of the best from our ANZAC Day clash at Suncorp Stadium, proudly supporting Mates4Mates! Video - All 8️⃣ goals from our 5-3 thriller against Brisbane Roar on ANZAC Day. All 8️⃣ goals from our 5-3 thriller against Brisbane Roar on ANZAC Day. Video - Wanderer Olivia was devastated when Mark Bridge left the club in 2016. Wanderer Olivia was devastated when Mark Bridge left the club in 2016. Video - The boss has the latest on the squad heading into tomorrow's clash with the Wanderers. The boss has the latest on the squad heading into tomorrow's clash with the Wanderers.